Choosing a pair of virtual reality goggles can be a daunting task for the average iPhone user. This article provides an overview of the 10 best iPhone VR headsets in 2018, along with their prices and key features, to help you narrow down your search. Our list of the best virtual reality headsets is based on price, user-friendliness, compatibility, and user ratings. There are no official iPhone VR headsets, yet. Still, this does not mean that iPhone users can’t experience this fascinating technology like their Android counterparts. There are many brands of virtual reality headsets out there, and most of them are iPhone-compatible. The list below provides a brief comparison of 5 of the best iPhone VR headsets out there, before talking more in-detail about all 10 of them. From CNN’s best VR headset for big kids to the Academic Choice Awards, the number of accolades the Merge VR Headset has received is unmatched. 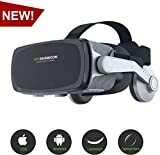 It is one the best iPhone VR headsets on the market. The Hamaxa 360° Virtual Reality Glasses are one of the best iPhone virtual reality headsets on the market right now. This product comes with its own Bluetooth detachable controller. The VRridum Virtual Reality Headset allows users to view 360-degree, side-by-side three-dimensional movies, IMAX style. You can adjust the focus using the distance and lateral controls. The Canbor VR headset relies on premium lens technology, with its aspheric resin lenses. The lenses also protect your eyes against the blue light your phone emits. The headset also comes with audio integration, besides visual integration. 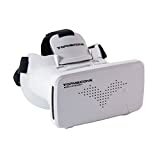 With a great average rating and plenty of reviews, the Pasonomi 3D VR Glasses seem to be one of the favorite VR headsets on Amazon. They are comfortable, ergonomic, and compatible with a wide range of devices. 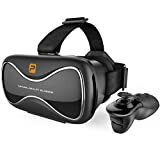 The Magicoo 3D VR goggles are one of the best sellers in their category. If you are looking for a lightweight, easy to use pair of VR goggles, this could be the product for you. The Bnext VR Headset is one of the best headsets for gamers. You can also get an above average 3D IMAX experience with it, but its gaming features stand out. 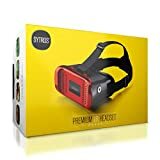 The Sytros VR goggles are designed to work well with eyeglasses, so if you wear glasses and are in the market for a pair of VR goggles, this one might be worth checking out. 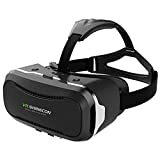 The VersionTech second generation VR headset is among the best iPhone virtual reality headsets. The VR device offers premium VR experience at a very pocket-friendly rate. This amazing Virtual Reality Starter Pack contains a simple, lightweight VR headset with a 360-degree view. This product has over 900 reviews, and averages a 3.7-star rating on Amazon. 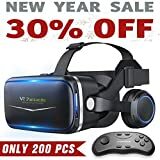 If you are on the market for an inexpensive VR headset with premium features, any of the above products could be a great choice. 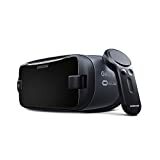 Feel free to share your thoughts on these products, and suggest any other product you feel that we have left out of our best iPhone VR headsets list.